Seattle Angel Conference: You're invited to Pitch at SAC V! Feb 18 - Pitch Perfect! As you develop your business, you will end up talking to many people about your startup. Getting clarity in how you express your efforts will make a huge difference in how your audience responds. Whether it is your family, a customer, an investor or an economic development person, how you tell the story of your company will impact your success. Tolis Dimopoulos will host a workshop on pitching your company. It will be focused on the conversation with Angel Investors, but has value to anyone who is working to get clarity in their presentations. The comfort of your own desk REGISTER HERE (Eventbrite) to get details Free! What items have to be on your Funding checklist? Can you take investment? Joe will help you be ready for when you get to a Yes with an Angel Investor! Come listen to Joe Wallin talk about getting prepared for taking an Investment. Must be purchased by March 1st! Register for the SAC V Conference Now! It doesn't cost any more to enter than to attend, but you get so much out of it. Every applicant will receive direct feedback on their business model. The semi-finalists will receive coaching. Register Today as a presenting company! To attend the conference, register at eventbrite before March 1 and you SAVE big! 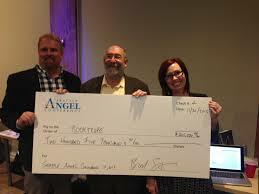 The Seattle Angel Conference is an investor led event, connecting Entrepreneurs and new Angel Investors. More about Seattle Angel Conference and how we're working to build a community of Angel Investors, and Funding Ready Entrepreneurs.